We were onboard MSC Cruises' MSC Seaside for part of the ship's inaugural sailing in Europe (Trieste to Barcelona) before it heads to its year-round homeport of Miami. The 4,134-passenger ship will be christened there December 21. MSC Seaside is the second major ship launch for the line this year (MSC Meraviglia was the first). As "the ship that follows the sun," Seaside has been specifically designed for warm climates. The mission is evident in the design, which is unique in its scope. It's obvious that MSC paid attention to detail and made the ship relevant to where it will be based. Here are our first impressions of MSC Seaside. The entire ship looks out to the ocean, and considering its size, an astonishing 73 percent of cabins are either balconies or outsides. You'll also find a double-width promenade on Deck 8 that's lined with bars and restaurants for alfresco dining and drinking. In keeping with its outdoor theme, Seaside offers outdoor spa and fitness facilities, including spots for open-air spa treatments. It also has the longest (426-foot/130-meter) zipline at sea (more on that below). But it's the aft of the ship where you'll find the real wow: Miami-style "condo cabins" complete with wraparound balconies and -- another industry first -- aft outside elevators. A deliberate nod to the ship's homeport, these staterooms are quite simply jaw dropping, combining elegance and style with effortless cool. We've never seen an aft like it (because there isn't one). We also love the aft South Beach pool and indoor/outdoor South Beach bars, which lie directly below the balconies. We predict these will be a huge hit. It's worth mentioning, however, that MSC never loses sight of its Italian heritage, and those passengers who love the bling and glitz of an MSC ship will not be disappointed. 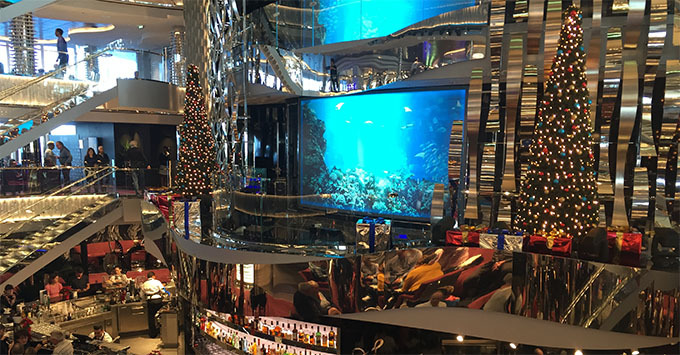 The four-deck Atrium is knock out. Seaside has the line's signature Swarovski crystal staircases rising up four decks (3,500 euros per stair – kerching!) and the Italian glamor of its predecessors, but with even more chrome and mirrors. It all says: "We're designed for Americans but we've still got Mediterranean elegance." The Atrium has bars on each deck (including a very classy Champagne bar) and also recessed balconies on decks 6, 7 and 8, where musical performances and aerial acrobatics take place. Behind each balcony is a large LED screen with rotating scenes that include jellyfish, plants and other nature-themed visuals. 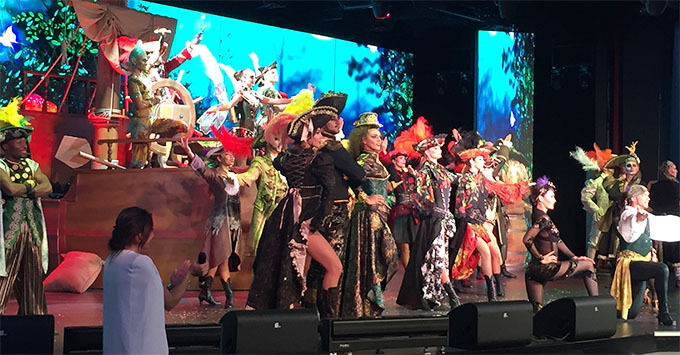 It's hard to top Cirque du Soleil (which performs original shows on Meraviglia) as onboard performers, so the line has gone in a slightly different direction on Seaside. This ship mixes what it has historically done best -- i.e. acrobatics, magic and other nonverbal offerings -- with internationally appealing American favorites (Disney characters and music, for example) and visually astounding feats. Expect acrobats, a bit of magic, fantastic singing and dancing, and even local performances from the places the ship visits. Of the ones we saw, our favorites were The Dream, a trippy revue of well-known Disney songs with a steampunk twist, and Peter Punk, a new take on Peter Pan, which involved a scary-looking Captain Hook, a troupe of pirate dancers, a hoola-hooping fairy and random appearances by a T-rex. It's fair to say that historically MSC has not been known for great cuisine, but the line has worked hard on this in a number of ways, including forming partnerships with celebrity chefs (Roy Yamaguchi) and internationally renowned food chains (Eataly), as well as crucially introducing a number of well-considered specialty restaurants. The line also makes much of its food (pastries, pasta, mozzarella etc.) onboard. New to the line is upmarket seafood restaurant Ocean Cay, which for us was the most pleasant culinary surprise onboard. The crab cakes were delicious, the sea bass was superb, and it was all set in a relaxing nautical but chic atmosphere. Bistrot la Boheme is the ship's French bistro, which offers delightful soups, quiches and other fare in an open area surrounding the atrium on Deck 8. Specialty restaurants also include Teppanyaki, which debuted on Meraviglia. On Seaside, thanks to a partnership with acclaimed chef Roy Yamaguchi, the eatery makes up one-third of Asian Market Kitchen, which also features an a la carte-style pan-Asian area, as well as sushi bar. Butcher's Cut is an all-American steakhouse serving prime cuts of meat. You'll find one on pretty well every cruise ship afloat, but it's new for MSC, which has gone to great lengths to ensure the experience is right for the market it serves. MSC also has a new partnership with Italian chocolatier Venchi, which has two for-fee onboard outposts -- one indoors on Deck 6 that serves hot chocolate, gelato and candy by the pound, and one outside on Deck 7 that features ice cream, waffles and crepes. Be warned: Italian hot chocolate is the consistency of brownie batter, and it's utterly fabulous. Seaside has two buffets -- one for families on Deck 16, high up on the ship where you'd expect to find a buffet, and another on Deck 8, the promenade level. This is another deliberate design change, unique to Seaside. Having a second buffet on Deck 8 allows passengers to grab food and head outside to make the most of the sunshine. The water slides were not open on our sailing, due to inclement weather, but we did brave the zipline, billed as the longest at sea. Royal Caribbean's Oasis Class of ships heralded ziplines onboard, with passengers hurling themselves above one of the semi-enclosed spaces on those ships with little to view except the Boardwalk below. 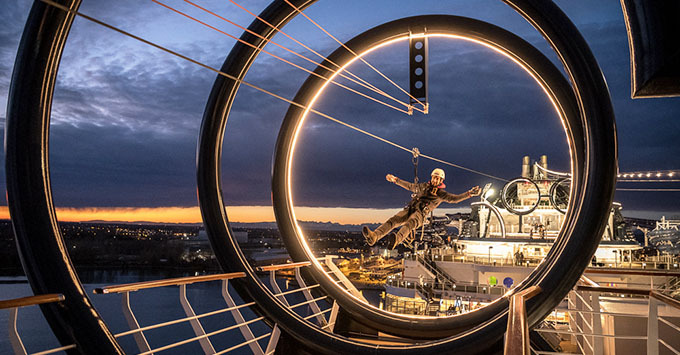 Seaside takes it up a notch or two with two longer side-by-side ziplines that stretch high above the ship's sports court and main pool, offering 360-degree views of the ship's surroundings. Another cool function: Passengers can twirl around via a little gadget fitted to the cord. Because it's longer (and goes a little slower) than the Royal Caribbean ones, the zipline allows you to take in the experience, rather than just scream your way from one side to the other. As with every new ship, there are a few minor glitches to iron out, and MSC has said it is committed to addressing them. We found service inconsistent, ranging from friendly and attentive to indifferent. But these are early days for this ship and the crew, which is working together with real passengers for the first time, and we're sure this will be smoothed out as the crew becomes more familiar with the ship's forthcoming clientele. Hopefully this won't be a problem by the time the ship reaches Miami and starts sailing in the Caribbean, but because the ship's focus is on bringing passengers closer to the sea and many of its public areas are outdoors, indoor spaces can feel crowded when the weather is inclement and forces people inside. If there's one thing Americans will miss in the ship's main dining rooms, it's a cocktail or beer with dinner and a cup of coffee with dessert. Apart from the usual water and soft drinks, the only beverages you'll find in the MDR are a featured cocktail or two and wine from an extensive list. We were told we'd have to order cocktails from a bar outside of the dining room and that coffee isn't offered there because it's provided at every bar onboard. We're delighted to report that following our feedback, MSC is already tackling this issue. 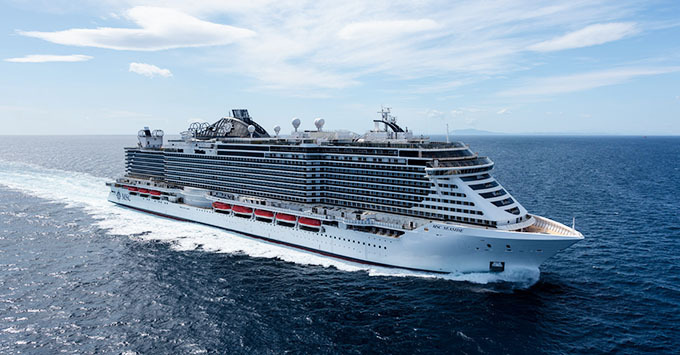 MSC Cruises has made no secret of the fact that it's aiming for the U.S. market (earlier this week, it announced MSC Meraviglia will be based out of New York from 2019), and this ship absolutely underscores that fact. But it's more than just paying lip service to that end; it's coming up with an idea and being prepared to invest untold millions into designing a ship for a specific market, which makes it such a perfect fit for Miami. We applaud that commitment and predict that Seaside will make big waves when it sails into its Florida homeport on December 21.